Christine McMahon has always taken pleasure in a good story and the craft of writing, but didn’t pick up the challenge of a novel until shortly after her mother’s prediction of a beautiful little boy entering her life. Of course there was no one there, but after her mother’s death, she found herself with pen in hand, beginning Jamy’s story. “Jamy evolved naturally. I’ve never had to worry about “who” he is, because every part of his story is there instinctively. He has been a joy to write about, even through his dark days as portrayed in my first novel, Choices Made: The Street Years. As Christine documented Jamy’s story, she found he had much more to tell of his life and inner conflicts. Choices Made: Missouri or Misery continues Jamy’s story, as he tries to rectify his life’s struggles with achieving his dream of being an artist in Paris, and being a good father to his son. Can he forget about his past and family to achieve them? Jamy is settled in Paris, but as a child he wanted a father. Now, JamyNick wants his absentee mother. Can Jamy learn the lesson The Heart of MacGregor sought to teach him and forgive the past? Can forgiving Linde bring her back into their lives? As Christine walked with Jamy through his life, she keenly felt his angst and wondered if he could be the man he was meant to be. Could Jamy, Linde, and JamyNick finally be a family or will Jamy always be alone? Find out in Choices Made: Always, which brings us to the end of Jamy's journey. Christine and her husband, Joe, live in rural Wisconsin on a restored prairie. 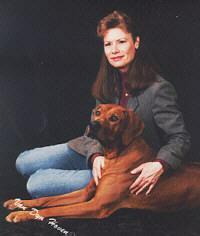 She is shown here with one of their champion Rhodesian Ridgebacks. Book 2: Fathers and Sons. I hope you will enjoy traveling with Jamy on his life's journey! Copyright © 2005 Choices Made. All rights reserved. Revised: December 18, 2017 .